I have to be honest with you, Internet. Right now I am angrily biting the nail polish off my nails. I have extremely breakable nails, so I try to keep clear nail polish on them; you know, the super thick stuff. This stuff is also great fun to peel off when irritable. Come on, you know you’ve done it before… please? I had big plans to bake something to bring to work tomorrow for some upcoming and recently passed birthdays, and I needed it to be flourless. But at this point I’m feeling like God made flour for a reason, and we just shouldn’t fight it. I know, I can’t even believe it myself, but I tried those cursed black bean brownies again. No changes or alterations, just completely by the book. I was low on agave syrup, so I used half agave and half honey. They came out tasting so strongly of honey that it’s practically oozing from them. Don’t worry, my curiosity about these things has been sated. I’m burning the recipe – never again! Next I tried a flourless chocolate cake. The recipe stressed to gently fold in the beaten egg whites to the melted chocolate. Maybe I was too careful, because now it just seems completely bland. Ghost failures twice in one night!!! I don’t even want to think about baking anymore right now. Let’s talk about dinner, okay? Dinner, unlike tonight’s stupid desserts (grrr! ), turned out quite well. 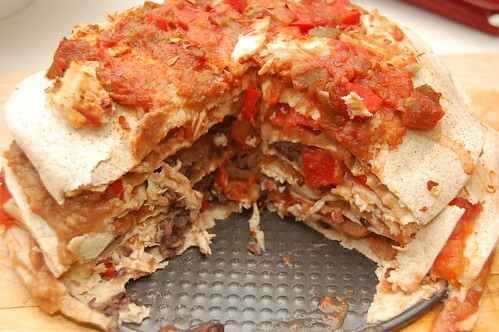 A few years ago I tore a recipe out of a magazine for some kind of tortilla pie. 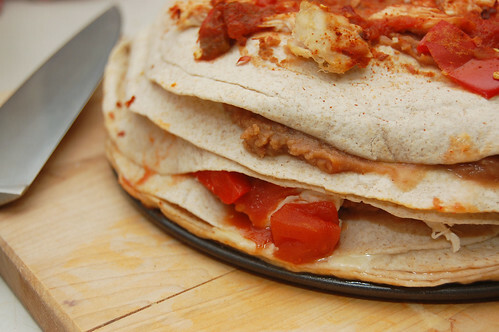 The tortillas were stacked high and stuffed with cheese and black beans; it looked great. Unfortunately, I lost this recipe before ever getting to try it. So instead I tried to create something similar but with less cheese and more beans. 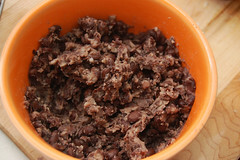 Seven tortilla layers total – I alternated layers of black beans and refried. I also included shredded chicken, diced red pepper, garlic, a combination of diced tomatoes and salsa, and the tiniest bit of cheese on each layer. I just included spice on the top layer, but feel free to mix the spice throughout. I also cooked mine in a springform pan to avoid any potential toppling problems, but I think that you could get away with using a pie plate or cake pan as well. My husband really loved this and kept making trips back to the kitchen for leftovers. Enjoy! 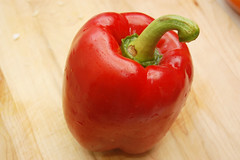 Preheat oven to 375F. 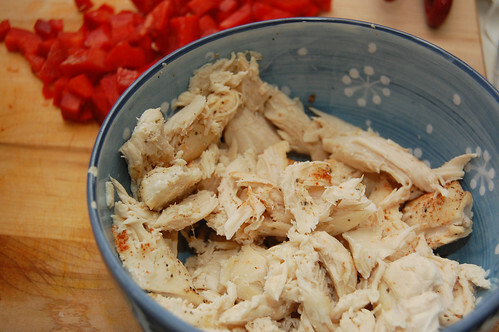 Measure and prep ingredients and bake chicken (if looking for a way to bake the chicken, you can use my style found here. Because it’s only one half pound you will not need to bake it as long. Be sure to cut into the middle of the thickest piece to make sure it’s fully cooked. Shred with a fork). Combine diced tomatoes and salsa in the same bowl. 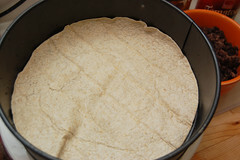 Lay one flour tortilla in the bottom of a springform pan (or pie dish or cake pan with high sides). 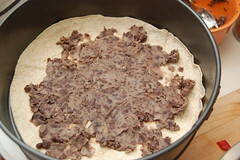 Spread a thin layer of the mashed black beans over the tortilla. 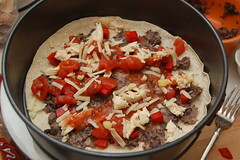 Follow with shredded chicken, garlic, red pepper, salsa mixture and sprinkle with cheese. Be a little careful near the edges so that your filling doesn’t spill out. 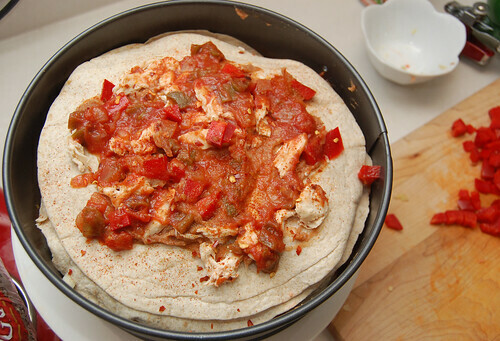 Lay another tortilla over this and push down gently to level it. 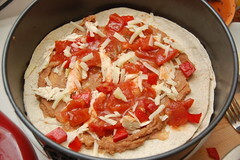 This time spread refried beans over the tortilla, then include other ingredients as before. This recipe makes just enough, so don’t make your “filling” too thick or you will run out. I was especially stingy with the cheese. Continue to alternate layers. On very top layer, sprinkle remaining ingredients evenly along with 1/2 teaspoon of red pepper flakes and cayenne for some heat. Be sure to take the salsa mixture to the edges of the top tortilla so that the top does not dry out and become too crispy while baking. Bake for 25 minutes. Serve in wedges. I do believe that I would love that with a fiery passion….with a ton of hot sauce.